Soda Crystals are alkaline. The main uses of Soda Crystals are to dissolve grease, soften water, loosen dirt and reduce acidity. Soda Crystals, along with soap and Soap Flakes, were virtually the only domestic cleaners at the turn of the twentieth century. They were used for cleaning and laundry and can even be used in cooking. 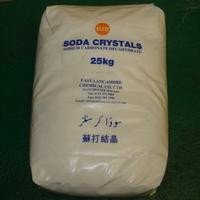 Still available in free-flowing crystal variety, Soda Crystals are now also available as a liquid version - ideal as a surface cleaner, a trigger spray version and for commercial use in an anti-bacterial formula. These Soda Crystals are supplied in a large 25 kilo sack.